Harmer - Central Heating Engineer, Plumber based in Cheshunt, Hertfordshire. 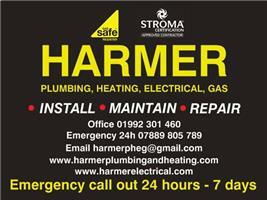 HARMER is a highly experienced and professional plumbing, heating electrical and gas company. We are based in London covering the whole of London, Hertfordshire and Essex. With over 30 years’ experience, Gas Safe registered and Stroma certified you can be sure that our service is safe and to a very high standard. We specialise in boiler repair and installs. We are accredited installs for Vaillant, Worcester and Ideal and can offer warranty of 7 year + on new boiler installs.